The people who migrated to the Indian peninsula were the Negroids and the Australites. These people spread to the various parts of India. During the duration of the Indus valley civilization which was purely an Indian development these people were joined by the long head fair skinned east Mediterranean people. The Nagas occupied the Nabada region of the Indus civilization. The Kuru – Panchalas who were expanding drove the Yadavas out of Sourasena. The Yadavas in turn drove the Nagas from the Nabada region and created the Yadava Boja states of western India. The Nagas moved south and settled in the Malabar and the Coromandel coast of south India. The Nagas brought about a great deal of development including the bringing south of the north Dravida dialect Centamil which became the standard language of the Tamils. In the Coromandel coast the Nagas who were traditional fishermen (the Paravas) founded the Madurai Kingdom with its capital first at Kokai and later at Madurai. The Nagas also founded Jaffna and occupied the north east of Ceylon island and the kingdom was called Nagadipa. They also moved into Keleniya and other places in Ceylon. The Naga capital at Nagadipa was Kathiramalai and the port was at Matota. Many Hindu Nagas became Buddhists in South Indian and Jaffna. In Jaffna there appeared Buddhist monasteries and viharas as was discovered by Dr Paul Peries in his archaeological excavation of Jaffna. There also appeared many Buddhist shrines in Kathiramalai ( it was Kathiramalai during the Naga Hindu period and Kathirgoda when the Buddhist Nagas spoke Singhalese and today it is called Kantharodai. As a result of the work of the Nayanas and the Alwars who started the Bakti movement many in south India were reconverted to Hinduism. It was felt by the Buddhists in Ceylon that the return to Tamil would result in the return to Hinduism. A new language emerged to prevent this from happening. The Singhalese people who were formed by the Nagas, the Tamils, the Kalingans and the Vedas. In his study of the composition of the Singhalese people Dr Gautam K. Kshatrya of the University of Delhi stated in his paper that the Singhalese people were 70 percent South Indian Tamils which included the Nagas, 5 percent Vedas and 25 percent Bengalis. The Bengalis had not settled in Ceylon. In the past the Indian states of Anga, Wanga and Kalinga were settled by the same people and they intermingled. According to the Mahavamsa the King of Wanga married a princess from Kalinga. The story may not be true but it proves that the people of Wanga and Kalinga intermingled. Singhala nationalism and the religion of Buddhism became intertwined. In the early days those that professed Buddhism in Ceylon had no animosity toward the Hindus but slowly the idea that being Singhalese means that a person must be a Buddhist was cultivated. Pali was used and it became the vehicle to meet the threat from Hinduism. Buddha’s teachings were always in the vernacular and transmitted orally. After Buddha’s death all Buddhist literature was translated into Pali. The Pali language came to Ceylon with Buddhism. It led to a serious study of the language. 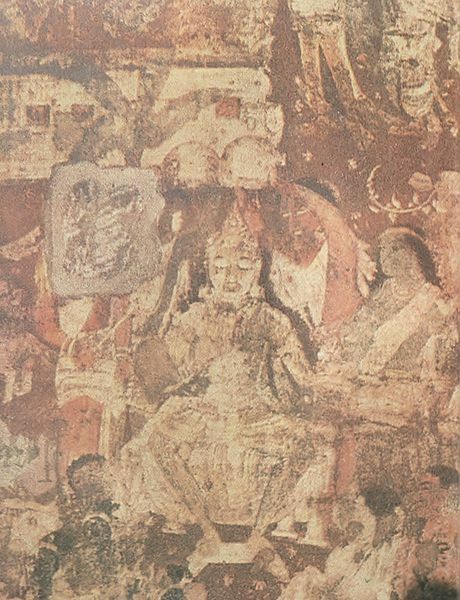 The teachings of the Buddha and the Jataka tales were in Pali. The use of Pali became more common after the arrival of 2 South Indian monks called Buddhagosa and Buddhadatta. Buddhagosa who had lived in Magdaga came to live at the Mahavira at Anuradhapura. His first work was Vasuddi Magga the way to purity. The next was Mahaattakatha the great community. He wrote also commentaries on the Venaya and also the Dharmapada and other works. Buddhadatta was a native of the Chola country. He came to Ceylon and later went back to his monarchy along the banks of the river Kaveri. He wrote the Pathmatha Depani and the Pathmatha Manjura secular works later followed. The Culawamsa and the Mahawamsa also appeared. R.A.L.H. Gunawardene observed that the Singhalese language development was a long process. The Singhalese language appeared to resemble the Indo Aryan language of North India. Writing in Pali was continued. There were glossaries and the like and then the life and virtues of the Buddha appeared. Dharmakurti wrote on the tooth relic and by 1250 AD literary Singhalese has appeared. The script took a more rounded shape. Tamil and Singhalese co existed for a long time. The North Indian ancestry for the Singhalese was based on the legend of Vijaya. According to the Mahawamsa the princess who was a daughter of the King of Wanga and his Kalingan wife was imprisoned by a lion and had sexual relations with the lion and bore 2 children. This is unnatural. 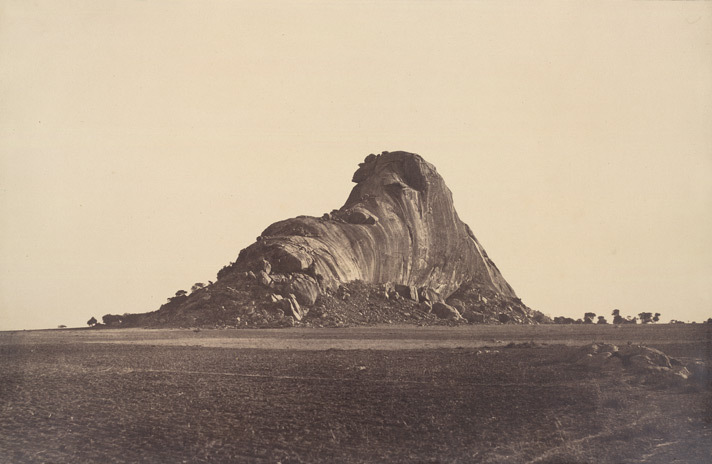 The son Sinhabahu after slaying his father the lion founded Singhapura which was claimed to be in Northern India but according to General Cunningham the father of Indian archaeology wrote in his book “The Historial Geography of India” that Singhapura was in Kalinga. According to the Mahawamsa Sinhabahu banished his son Vijaya and his 700 companions from the kingdom and they finally arrived in Ceylon. H.Parker in his book “Ancient Ceylon” wrote that the banishment of Vijaya and his 700 companions appeared to be fictitious. It is clear that the legend is steeped in myth. It is not possible for a lone woman with 2 children to traverse the Indian continent from the west to the east. The Boja states had been established by the Yadavas and were controlled by them. The states of Anga, Wanga and Kalinga were considered M’lecca as Agni Vasudeva has not burnt over the land and so it was unfit for habitation by Aryan Brahmins. The Mahawamsa also claimed that the Buddha visited Ceylon thrice. The first supposed visit is mentioned the Buddhist Tamil epic Manimekalai. According to the Manimekalai it was at Manipallavam whereas in the Mahawamsa it was claimed that it happened at Nagadipam. According to Dr K.M. 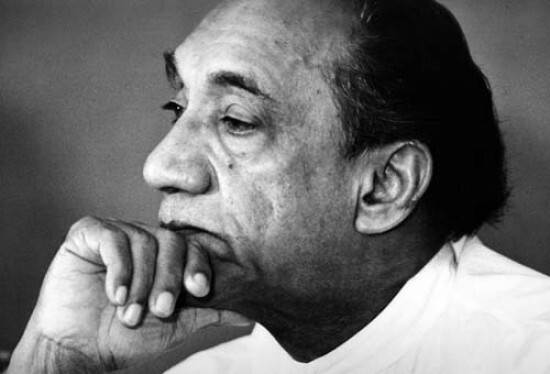 de Silva the most powerful myth invented in Vijaya’s landing in Ceylon and the basis of the conception of the Singhalese as the chosen people of Buddha and Ceylon itself as a place of sanctity for the Buddhist religion. There was no perfect fit between Buddhism and the Singhalese language at that time. In an attempt to make Ceylon appear as a land intended for Buddhists, Vijaya’s landing was made to coincide with the death of Buddha. Duta Gamani who defeated Elalan for the Anuradhapura throne was depicted as a Singhalese hero. Principalities ruled by Tamil speaking Hindu rulers which Duta Gamani had to cross were painted as hostile. Elalan was not Chola prince and in all possibility was a Velir who established principalities in Tamil areas. The Chola kingdom came into existence only in the 1st century AD. This is a mistake on the part of the author of the Mahawamsa. Elalan was a just king as admitted even by the Mahawamsa. Even as late at the 18th century AD the Singhala nobility would not cross the memorial of Elalan without alighting from their horses. Buddhists were not persecuted under Elalan’s rule. He helped both Hindu temples and Buddhist holy places. Kings who practiced Buddhism also endowed Hindu and Buddhist temples. Duta Gamani is on record as having rebuilt the temple of Skanda in Kateragama sacred to both Buddhist and Hindus. There was no enmity between the Tamils and the Singhalese at that time. Duta Gamani fought for the Buddhist against a foreign Hindu ruler. In a further attempt to give the Singhalese a north Indian ancestry the name of Vijaya’s successor and the second ruler of the dynasty was changed from Panduwasa to Panduvasudeva. Panduvasudeva was a north Indian monarch during the Mahabharata war. Panduwasa was actually from Madurai. He was the nephew of Vijaya’s Madurai wife. Panduwasa was therefore a full blooded Tamil. A myth connected with this is to claim that Kenchana the wife of Panduwasa is a member of the Sakya clan to give him a connection with the Buddha. It was claimed that she floated down the river Ganges something that is impossible. The Mahawamsa was written by a Bikku Mahanama in the 6th century AD. The Sangha had received a lot of land, endowments and privileges and there was a fear of losing them with the return to Hinduism. The Mahawamsa was written to pit the Buddhists against the Hindus. King Gajabahu brought in the worship of Kanaki under the name of Patani Deviyo. The Singahalese poem Vayantimalaya, Pallangahalla and Patanihala was to connect to the worship of Kanaki. Gate Mudaliar W.P. Gunawardene saya that the important determining factor in a language is structure and not vocabulary. Therefore Singhalese is a Dravidian language. Father Closett the linguist also came to the same conclusion when he observed that Singhalese sentences were essentially Dravidian and the majority of the words are of Dravidian origin. Dr Godakumbara says that the Singhalese grammar drew a lot from the Tamil grammar Virasolium. K.M. de Silva remarks that there is considerable Tamil influence in vocabulary, idiom and grammatical structure in Singhalese. Tamil literary works were studied in Ceylon from early times. The Singhalese poem Subasilakarya drew from the Naladiyar. The poem Lokopakarya drew a lot from the Tirukural. According to E.R. Saratchandara many Singhalese nadagams were copied from Tamil originals. Mudaliar C. Rasanayagam drew attention to the fact that the lion used by the Nagas at Nagadipa became the standard used by the Singhalese. Perhaps the author of the Mahawamsa got his idea about the lion from the Nagas. The clergy tended to invent unrealistic events in their writing. The story of Vijaya was subject to this. Dr P. Ragupathy says that the Singhalese and Tamil identities stem from a common cultural stratum. It is believed that Vijaya was a merchant prince from Singhapura in Kalinga who was impressed by the trade in Ceylon. He arrived in Ceylon and married Queen Kuveni for this purpose. She had fed Vijaya and his crew rice and other articles taken from ship wrecks. Finally Vijaya took over Kuveni’s kingdom and got her killed. There is no harm in Buddhist Nagas being Singhalese but to claim a north Indian descent for the Singhalese is carrying on the Aryan – Dravidian spat. The Singhalese language being classed as a Indo Aryan language is wrong. There may have been prestige in one saying that he descended from the Aryans in view of the lightness of the skin colour. It should be noted that it was the Dravidians who first indulged in foreign trade and later embarked on overseas colonial expansion. The Kalingans like other Dravidians took to the sea. All Indians from South India are known as Kelings particularly in the Malay world. The basic needs of mankind is adequate food, clean water, the ability to use the own language and to develop it, cultural expression, democracy and good governance, good hygiene and the provision of utilities. All religions preach the common virtues of kindness, honesty, humility, justice and the respect of others. A small minority of chauvinists who having their own agendas are not bothered about what happens by their actions and the instability that follows. The beauty of multi cultural diversity develops tourism, encourage local and foreign investments to bring about further economic development. It is suggested that the reliable history of Ceylon starts with the coming of Buddhism. Buddhism came to Ceylon when Mahindra the brother of Asoka was on a mission to south India and crossed over to Ceylon. It gives the lie to the Mahawamsa claim that Mahindra was the son of Asoka and Sangamitta was his sister and they flew into Ceylon from Magdaga. Sangamitta came to Ceylon later to found the order of nuns and she was not Asoka’s daughter. Tissa was a contemporary of Asoka and cannot claim to be his friend. In none of Asoka’s edicts is found the mention of Lanka and no reference was made to Asoka’s children. 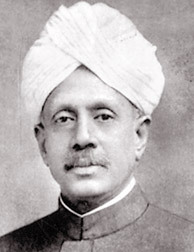 Vincent Smith the historian described the account in the Mahawamsa as a tissue of absurdities. According to Mudaliar C. Rasanayagam the standard of the lion was used by the northern Nagas before the coming of Vijaya. It is possible that when the Nagas took over the Anuradhapura kingdom the lion emblem became the emblem of the dynasty. The Auradhapura kingdom did not cover the whole island of Ceylon. There were other states and principalities. This entry was posted in Ancient India, Ancient Nagas, Ceylon History, Jaffna and tagged Ancient India, Ancient Jaffna, Ancient Nagas, Ceylon. The development of Ceylon society is the same in all respects to South India. The emergence of the first group in the Indian peninsula, according to Mr. V. Kanagasabai who wrote the history of the Tamils using the Sangam Classics were the Villars (the bowmen) and the Meenars (who were fishermen). In the development of South India, land was divided into kurinji (hill), palai (desert), mullai (grassland), marutam (valleys) and neytal (seas). The various groups developed depending on the work they did. In Ceylon, the Govigamas emerged as the highest caste. There was no large scale grazing lands and the Govis took over the function of herding. The Govis also indulged in trade. The Brahmins, who came later, were accepted as the highest caste. Other groups also developed. The Karava (fishermen) refused to accept the superiority of the Govis. In Jaffna, the groups developed in this way. The Paravas (Naga fishermen) founded Jaffna and inhabited the place. It only rained during the Northeast monsoon and there were no rivers. But there was plenty of underground water. The soil was such that it retained most of the water underground. Wells had to be dug to draw water out, and then agriculture was possible. There were groups that came. The first were the Pannikans, described as teachers and workers. They easily took to weaving, agriculture and trade. The called themselves the Pillais. They settled in Madurai and Tirunelvelly and came from the Malabar coast. They are Nagas, or related to them, and could have migrated to Jaffna. If they had acquired land and carried on agriculture, they could claim to be Vellalars. The deep-sea fishermen of the Nagas could have become the Karaturai Velllars. 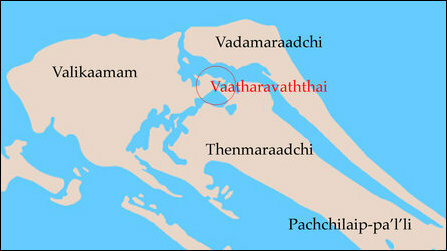 The Pattavans (fishermen who lived in pattinams or towns) could have acquired land and took to farming and called themselves the Varnakular Vellalars. Caste migration could have taken place. Mudhaliyar C. Rasanayagam feels that Kailamalai, Yalpana Vaipavamalai and Vyapadal (all are ancient Tamil texts on Jaffna) are not reliable as they lack historicity. Maylvagana Pulavar, author of Vaipavamalai, indulged in fanciful deduction. Vya Iyer led his imagination run wild. He wrote Vyapadal. According to Tolhapiar, who wrote the Tamil grammar text Tolhapiam, said in it that the Vellalar had no other calling other than to produce rice. This probably led to the Tamil proverb that a Vellalar can never be king. Visvanathan Mudaliyar, the Vijayanagaran ruler of conquered Tamilagam, left out the Vellalars when creating the Palayam system (where the whole country was divided into administrative section and given to various chieftains to govern and defend). Some dissatisfied Vellalars in Tamillagam emigrated to Ceylon and mostly settled in the Singhalese areas of the south of the island. The Madapalis, the relatives of the Chakravarti rulers claimed a higher caste position as they were Brahmins. The Dutch authorities in Ceylon had been warned by the home Government not to interfere in the disputes of the local people. The Dutch solved the problem by registering the Madapalis as Vellalars in the population Thombus (register of people). There are many proverbs that emerged regarding the Vellalars. The Vellalar is like brinjal, palatable when cooked with any kind of vegetable. The Kallan, Maravan and Akmadyan slowly became Vellalars as they acquired land and started farming. Another proverb says that agriculture is no agriculture unless done by a Vellalar. Dr. D. M. Rajanagiam in his book on Jaffna, said the herdsmen (Mullainatars) of South India were the Idayars, the Konnars, the Kovinders, the Kopiars and Koviars. Some of these Mullainatars could have emigrated to Jaffna They sold milk and milk products in Punalai and other places. Dr. Rajanayam disagrees with Mudaliyar C. Rasanayagam that Koviars were the remnants of the Singhalese Govi traders. Mudaliyar Rasanayagam is right when he says that there was no such caste in Jaffna before Sankili’s (one of the Chakravarti kings) action of expelling Singhalese Buddhists from Jaffna during the 16th century. It appears that the corruption of the Singhalese word Govi (into Koviar) is correct. It is possible that the Koviars were equated by the Jaffna residents to the herdsmen in South India. When the Naga Singhalese-speaking Buddhist of Valigamam acculturized to Tamil Hindus, which was quite easy for them, they were referred to as Koviars. Ugra Singan, the Kalingan ruler of Jaffna, shifted the capital from Kathiramalai to Singainagar (near Vallipuram) on the East coast of Jaffna because the people of Valligamam were Buddhist Singhalese speakers. Kathiramalai, when it was populated by Singhalese speakers, was called Kathirgoda. Today, the place is known as Kandarodai. Chunnakam, Uduvil, Malakam, Veemagamam were all Singhalese names. Some kanis (rice fields) were owned by Singhalese people and had Singhalese names. According to Michael Banks, who has made a study of this, the Vellalars and the Koviars arose from the same stem. The richer landowners who were agriculturists, considered the poorer ones who lived on their lands and worked for them, as Koviars. In Vadamarachi, Thenmarachi and the islands, this was so. It explains the ritual equality and similarity of customs and cattle brands of the two groups. The Karaiyars are the descendants of the Naga fishermen who colonized Jaffna. At first, the Paravars carried on fishing as their traditional occupation. Plenty of underground water was discovered and some took to agriculture. Some of the Karaiyars still carried on with the tradition of fishing. When the Portuguese in India had trouble with the Nayak of Madurai, the preachers and the new Catholics went to Mannar and Jaffnapatinam. Previously, the Karaiyars served in the armies of the Annuradhapura and Jaffna kings. During the Chakravarti rule, the Karaiyars of Jaffna manned their powerful navy. The Karaiyars refused to accept the caste superiority of the Vellalars. During the Portuguese period, the Karaiyars along with the Vellalars were appointed village headmen. In the early days when the Catholics came to Mannar and occupied two towns (Periakareapattinam and Sinnakareapattinam), they were put to death by the Chakravarti ruler, Sankili. Within Karaiyur are the Jaffna town proper. Within the town is St. Patrick’s Cathedral, the Catholic Seminary, St. Patrick’s College, Holy Family Convent, St. James’ Church and Central College. The Karaiyas claimed direct descent from the Pancha Pandavars (royal family from the Mahabaratha) and in landtitles, they entered their caste as Kurukulam. There are two classes of Karaiyars: the Melongi and the Kelongi. The former are socially advanced, having enjoyed the benefits of higher education and employment in government and the private sector. The other group continues with coastal and deep-sea fishing. According to Reverend Father S. Gnanaprakasar (the author of the history of the Catholic Church in Ceylon), the Karaiyas should be classed as Kshatriyas (warrior caste) They constitute about 15 per cent of the population of Jaffna. At one time, the Indian peninsula was controlled by the farmer. The farmers, either because of non-payment of rent or by being driven away by others, became unemployed. The term Paraiyar came into use only after the 10th century AD by the Imperial Cholas. They found that caste divisions would make it easier for the collection of land rent. Tiruvalluvar was one among them. People are aware of this group’s connection with the land from ancient times. The Paraiyar is accepted as an expert on determining land boundaries. His decision is respected. In North Ceylon, many of this group took to weaving. In the Dutch Thombus, the Paraiyars registered themselves as weavers. The cotton industry was very important. There was large scale growing of cotton in Mannar and the Vannis. The town of Parititurai (Cotton Port) is enough evidence of the existence of the cotton industry in north Ceylon. The Nagas were skilled in the art of weaving. The Veddahs learnt it from them. Swami Vivekananda says that caste is not hereditary but depends on qualification. If anyone is qualified, there is nothing to prevent him from reaching a higher status. The basis for this line of thought is traced to the Baghavadgita. In the village of Chiviateru, the weavers produced fine cloth using the handloom. This group also lives in Kalmunai and call themselves the Valluvarkulam. Mr. Harry Williams, and English planter in Ceylon, wonders why Vellalars say that they have a common origin with the Paraiyars but the Paraiyars are still untouchable. In Jaffna, Paraiyars who lacked the means of support opted for menial work. It would not have been possible for Paraiyars to emigrate from Indian as they lacked money and other means to get to Ceylon. The Paraiyars form about 10 per cent of the Jaffna population. They are the descendants of the Veddahs. It was the Veddahs who brought the palmyra, coconut, betel leaves and nut to the Indian peninsula. The Nalavars saw service as soldiers for Indian kings. In Jaffna, they are the toddy drawers. They are the offshoot of the Sanars of India and are recent immigrants to Ceylon. The Sanars of India were oppressed by the higher groups there. Those who emigrated to Ceylon became the Chandars. In Jaffna, Chandars are found in Annaikoddai, Vanarpanai, Navali, Changanai East, Sandalipay and Alaveddi. Their main work is growing sesame and extracting its oil. The Brahmins form a small percentage in Jaffna. They came in after temples were built. They came in large numbers during Chakarvarti rule. They came from among Vellalars. They were priests in temples. They felt that they are Brahmins. The real Brahmins would not mix with them, considering them lower. The Madapalis, the kin of the Chakravarti rulers, considered themselves Brahmin but the Vellalars refused to accept their superiority. The Nagas produced the Tachars and the Kapal Tachars (woodworkers). The blacksmiths (Kullars), goldsmiths (Patthars) probably came from India. It is the same with the barbers (Ambatans) and Vannan (dhobbies). The Natuvars (temple musicians), Pandaram (temple priests) and forty other casts have been identified in Jaffna. They are quite insignificant in numbers and could be recent immigrants in India They form three per cent of the Jaffna population. People of different castes are so widely diffused that they are prone to cross-fertilization. After sometime, the distinction is forgotten and most people pass off as members of various groups. According to Dr. Gautam Kshatriya of the University of Delhi, the population of Jaffna consists of a mixed gene pool constituting 55.2 per cent Singhalese, 25.4 per cent Bengalis and 19.4 per cent South Indian genetic origins. The Chandas, the recent immigrants from India, the personal service groups, the temple priests and the Brahmins and the craftsmen form the 19.4 per cent of the population. What is stated as Bengali is Kalingan. In the old days, Angga, Wanga and Kalinga were populated by the same people and they inter-mingled. The Singhalese are the Nagas and the Naga Buddhist Singhalese speakers of Valligama. Vellalars form about 50 per cent of the Jaffna population. Not all of them could have come from India. This entry was posted in Ceylon History, Ethnic Issues, Jaffna and tagged Jaffna. During British intervention, Malay education was in the form of Quran schools. It was then realized that education of the citizens was the responsibility of the state. The priority of the British administrators in Perak and all the protected states was the establishment of an administration and preservation of law and order. The first time education was mentioned was in the report of Hugh Low, the Resident of Perak. He mentioned the setting up of an education institution to give secular education for the children in Sayong in Perak. It failed. The authorities felt that it was their responsibility to educate the Malays because they had treaty obligations with the Malay rulers. In 1904, the FMS had 232 Malay schools. Malay parents were found to be reluctant to send their children to schools that gave secular education because of the absence of Quran teaching. In Perak and Selangor, there were 12 schools for girls. There were no girls’ schools in other states. At Bandar in Selangor, where a girls’ school was established by the Sultan of Selangor, he introduced a bullock cart service to shield the girls from prying eyes of males. In 1897, there were 130 Malay schools in the FMS. 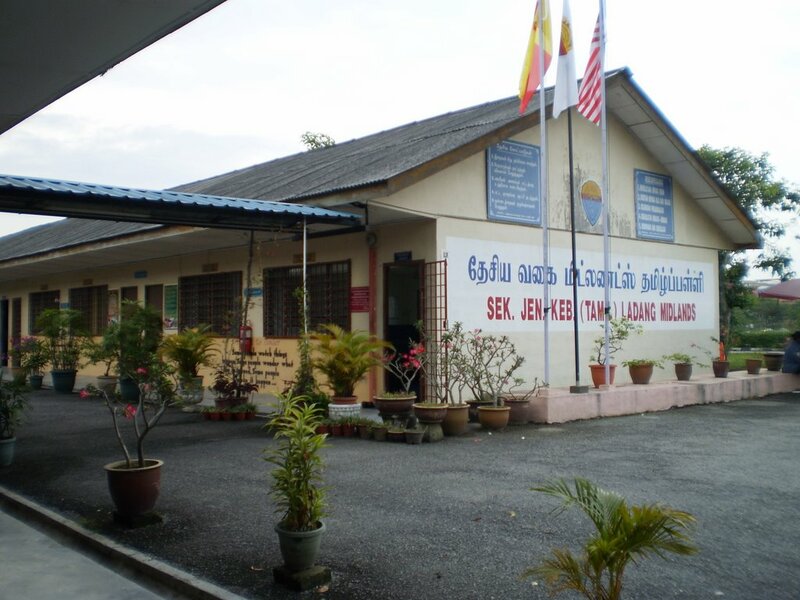 It was reported in the Resident General’s Report that the teaching in Malay schools was poor. Progress was only made by the girls school in Bandar because of the influence and encouragement of the Sultan. However, by 1900, there were 159 boys and 12 girls’ schools. Quran teachers were employed if desired by the parents in Perak and Selangor. No Quran teachers were appointed in Negri Sembilan and Pahang. The arrival of R. J. Wilkinson in 1903 as Federal Inspector of Schools produced a new era in Malay education. A number of textbooks on Malay literature were produced. In 1904, the Government appointed a committee, of which Wilkinson was a member. The result was that the Roman alphabet was introduced for Malay and saw the rise of Rumi (Romanized Malay) in Malay education. Until 1898, there was no scheme for the training of Malay teachers. Perak and Selangor set up a training institute in Taiping. In 1900, the FMS and the SS set up an institution in Melaka under an European head. 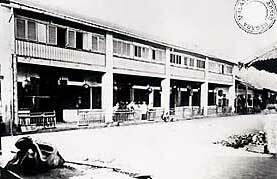 In 1922, R. O. Winstedt set up the Sultan Idris Training College in Tanjong Malim, Perak. In the Unfederated Malay States, the pondok schools and madrassahs exerted their influence, particularly in the East Coast states. The emphasis was on the teaching of Islam. Malay-ness was equated to Islam. But in the madrassahs, secular subjects were taught. Some school leavers from the madrassahs were able to continue their studies in English secondary schools. The first English school in the country was the Penang Free School, which was established in 1816 [Note: the author was Head of this school from 1979 until 1983]. In the FMS, the first English schools were five Government English schools and 13 run by the Christian missions. The total enrolment in English schools was 2022. The early schools were the Taiping Central School (later King Edward VII School), Taiping Girls School (later Treacher Methodist Girls School – Note: The author’s late wife attended this school in the 1950s), Anglo Tamil Taiping, Anglo Chinese School Ipoh and the Methodist mission opened schools in Parit Buntar and Telok Anson. The French Catholic nuns set up Convents. Later, Anglo Chinese Schools were founded in other towns. 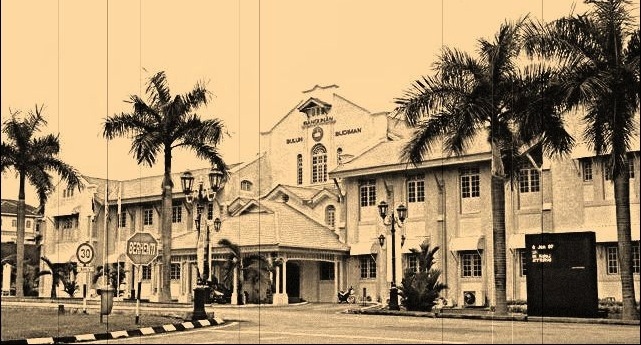 The Raja Class founded in Kuala Kangsar led to the establishment of Clifford School in 1927. 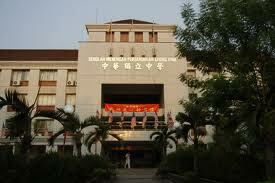 In Selangor, there was the Victoria Institution and Anglo Chinese School Klang (feeder to Victoria’s Institution). There was also MBS Methodist, St Johns Catholic and Bukit Nanas Convent. The Government’s Girls’ School became the Methodist Girls’ School. In Negri Sembilan, the first English schools were St Paul’s Institution, King George V and Tunku Mohammad School came later in Kuala Pilah. 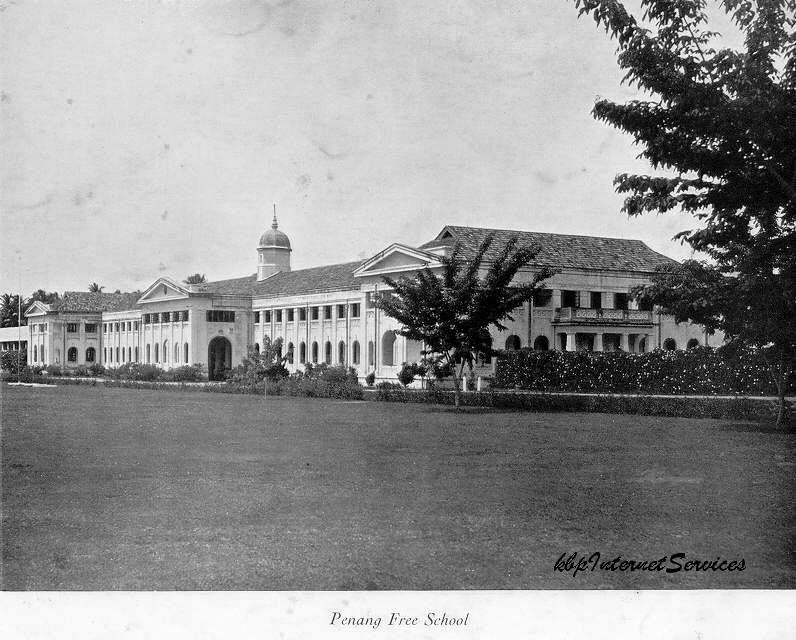 By 1907 in the FMS, the leading English schools were in the town of Taiping, Ipoh, Kuala Lumpur and Seremban. Enrolled in English schools were 2951 boys and 126 girls. The urban people were mainly Indians and Chinese. The English schools mainly served these people. The early teachers were pupil teachers. Young people were expected to shoulder the work of teachers. Practically, no help was received from the Head, either through ineptitude or being preoccupied with other administrative work. Various schemes were recommended but not implemented. English schools started with infant classes of two years, followed by the elementary classes of seven years, leading to Standard Seven. Some of the leading schools offered classes for Junior Cambridge Certificate and Senior Cambridge Certificate. These certificate classes were introduced in the FMS in 1900. An expatriate teacher at Victoria Institution, Mr. Howard Tyte introduced the normal class. He had six students from VI and MBS and gave part-time instruction. At the end of three years, the trainees had to sit for an examination. It proved to be a success and it was extended to other towns in the Malay states and Straits Settlements. It was a vast improvement on the Pupil-Teacher system. In the post-war years, there appeared a shortage of teachers. Earlier, Datuk E. E. C. Thuraisingham who was a member of the Federation of Malaya Legislative Council, recommended that the salaries of all Government employees should be raised to give them a decent standard of living. The Government appreciated the contribution of teachers but wanted an improvement to normal training. It was decided under Thuraisingham, who had become the Member of Education, to establish teacher training colleges. It was felt that teachers should be taught content and also the methods of teaching. It was also felt that having the colleges in Britain would expose the trainees to the vast expertise of the British education system. Training colleges were later established throughout the country. Day training centers were also established. The day training centers also trained teachers for the Tamil and Chinese mediums. The regional training centers were established in the 1960s because there was a shortage of teachers. Formal Tamil education in Malaya was mainly by Christian missionaries. The first Tamil class was held in Penang Free School. After 1870, Christian missionaries began establishing Tamil schools in Penang, Province Wellesley and Perak, to cater for the children of Indian workers in the sugar and gambiar plantations. In Bagan Serai in Perak, the Christian missions established schools where there were many Tamils. The government also established Tamil schools to cater to the children of Tamil workers. Ceylon Tamils also began setting up Tamil schools. The estates were required by the labour code of 1923 to establish Tamil schools. However, facilities provided were poor. Early teachers were the mandores, Tamil literate clerks, or Tamil literate labourers. In 1937, an Inspector of Indian schools was appointed in the education departments. Later, a scheme for Tamil teachers was introduced. In the 1950s, the Standard Seven examination in Tamil was introduced. All those who intended to become teachers had to possess the Standard Seven qualification. The authorities felt that the knowledge of agriculture and handicraft was sufficient. The Chinese in Malaya felt that the ability to recognize and use 2000 Chinese characters was sufficient. First established were the dialect schools. The fall of the Manchus as a result of the revolution of 1911, Chinese schools in Malaya became a battleground between the Kuomintang and the Communist ideologies. The registration of schools was introduced in the 1920s. It was decided to localize the Chinese schools. In 1935, the Education Department was asked to make changes in Chinese education. Subsidies were to be provided. A teacher training program was introduced. Mandarin was given formal recognition as medium of instruction. Some Chinese schools rejected the grants and aid from the Government. In the UFMS, until after the Second World War, the Chinese community opened schools and financed them. In the West coast states, a lot of Chinese schools were set up. As secondary education in Chinese gave no prospects, Chinese parents generally did not support Chinese secondary education. There were only 36 schools with secondary classes. Hence it was difficult to recruit teachers. After returning to Malaya at the end of World War 2, the British authorities appointed the Barnes Committee, headed by Mr. Barnes, an Oxford don. In its report released in 1951, the Barnes Committee recommended the establishments of a common national system taught in English ad Malay in order to build a common Malayan nationality. Criticism from many quarters led to the appointment of a committee consisting of two Chinese education experts, Mr. Fenn and Mr. Wu. The Fenn-Wu Committee Report supported the Barnes recommendations but said that Chinese vernacular schools should be retained in the national education system. In the election in 1954, the Alliance under Tunku Abdul Rahman, won in 51 of the 52 seats and Tunku Abdul Rahman became the Chief Minister of the Federation. 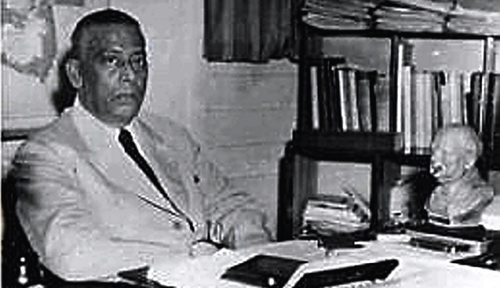 In 1956, the Razak Committee headed by the Education Minister, Abdul Razak recommended a common curriculum within the national education system in order to foster common loyalty to the nation. The Committee’s recommendations were presented in the form of the Education Ordnance 1959, which explained the Government’s aim to establish a national education system with Malay as the national language. After winning the elections in 1959, the Rahman Talib Education Committee was appointed. According to the Rahman Talib Report, the pluralist aspirations of the various communities were incompatible to the creation of national consciousness. Eventually, Malay would be come the main medium of instruction. At present, only English and Malay would be allowed at secondary level. Chinese Secondary schools had to change their medium. Under Article 12 (1) of the Constitution, Chinese, Indians and Malay pupils who are citizens of the country were guaranteed the right of admission to public universities. But an amendment to Article 153 of the Constitution in 1971 introduced the quota system for admission, giving greater representation to Malays and a lowering of entry requirements for them. As a result, public universities contained a majority of Malays leading to greater polarization. Presently, the country is experiencing a lowering of education standards. In the English medium schools of the past, there was greater mixing of the communities. English schools children were very united. Language medium of instruction is not important but mixing is. Greater mixing would bring greater unity. Objectionable features of the national education system should be removed so that national schools would become the preferred choice of non-Malay parents, as before. Chinese secondary education should not be permitted as such a measure would be divisive. However, there is provision for the entry of vernacular primary school pupils to enter the national system. The teaching of Chinese and Tamil in the national secondary schools should be further encouraged. This is provided for in the ordnances. Chinese and Indian departments should also be established in all public universities and courses offered. This entry was posted in Development of Malaya, Malayan History, Malaysia History, Uncategorized and tagged Education in Malaya, FMS, Penang Free School, Unfederated Malay States, Victoria Institution. The environment of Malaya plays a very important role in its development. The main geographical feature is a series of mountain ranges. There was heavy rainfall. From it arose the rivers. The Malay people settled on the lowlands and coastal areas. Rivers were first used as means of communication and trade. Rice cultivation drew settlers to flood land with convenient sources of irrigation. Malay kingdoms were cited and the capital was at a point near river mouths. All goods were taxed from areas watered by the main and subsidiary rivers. Land transport was very difficult. 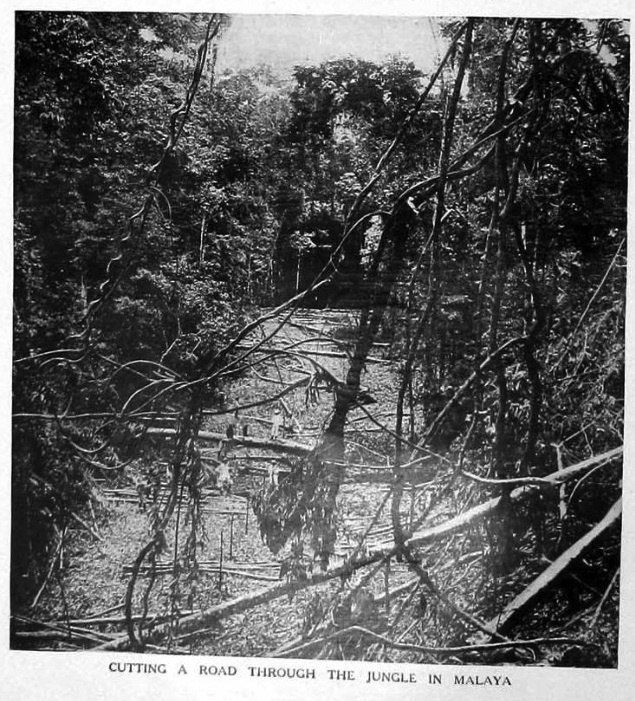 The jungle was difficult to penetrate. The carriage of goods using bridle paths was by elephant and human porters. The houses were built on stilts on riverbanks above the ground level to avoid floods. In the 19th century, there was a rivalry between the European powers for control of the tin deposits in Malaya. Tin was becoming an important raw material for the industrial revolution. Earlier in the 1840s, large tin deposits were discovered in Larut in Perak and in the valleys of Klang River and at Sungei Ujong. In the early days, mining was by the Malays. Later the Chinese came in. In 1874, the British came in to control the unrest in the tin-producing areas. The residential system was established in Perak, Selangor and Sungei Ujong. There was a need to connect the mines to the ports. Bullock carts were used. A gradient of 1:20 was maintained to allow for a smooth ride. Later, better rods were built and metaled if possible. Townships developed along the roads. In the townships, utilities were provided and other infrastructure arose. The government built accommodation for its workers. Accommodation was also provided for workers in the private sector. Individuals began building shophouses and houses for their own use or rent. Towns like Taiping, Ipoh, Seremban and Kuala Lumpur came into being. Later, as time passed, settlements began to move further inland. There appeared a further need for transport improvement. Road building methods were improved. Most of the towns were connected to the mining areas and principal ports. In 1874, there were already 13 miles of road in Perak. One was from Kota Klian to Ujong Tempoh on the Larut River. There was one road from Simpang to Bukit Gantang. Matang was also connected to Taiping. In 1875, the rich tin fields of Kamunting were also connected. The road was also extended to Province Wellesley through Krian. There as a thorough road to Penang. In 1876, Telok Kertang on the Larut River was connected to Taiping. In Selangor, the mining lands were much to the interior. The Klang River and the port at its mouth were the only outlets. Yap Ah Loy built roads from Kuala Lumpur to the mining areas. A road was built by Sultan Abdul samad connecting the mining areas with the Klang and Langat Rivers. In 1886, a road was built connecting Kuala Lumpurt to Damansara, about 16 miles long. Damansara lay on the Klang River. Later, a trunk road connecting the northern and southern parts of the mining areas was completed. In Sungei Ujong, a cart road linking Seremban to Pengkalan Kempas was completed in 1882. Later, roads were extended to Pantai and the valley of Sungei Ujong. Public works departments were established in all the protected states. By the end of the 19th century, the British also established in Pahang. PWD labourers were Indian. Engineers and Assistant Engineers were British. Technical Assistants and Overseers were mainly Ceylon Tamils. By 1902, there was a road linking Pahang to Selangor. Mecadamised road building was introduced. Labourers were housed in lines. Better accommodation was provided for the higher grades. Engineers were given bungalows. Kuala Lipis was connected by cart road to Kuala Kubu Bahru. A road from Benta in Pahang was connected to Selangor. In 1908, a road linking Kulim to Province Wellesley was built. In 1909, Kangar in Perlis was linked to Alor Setar. In the Unfederated State of Johor, the development of the railway led to road building. In Kelantan, roads were built to connect all the agricultural areas. Finally, Kuala Terengganu in Terengganu was linked by road to Kota Bahru in Kelantan. At the same time, the British administrators also planned a programme of railway development. Rail traffic was cheap and it was ideal for the transport of tin. Roads alone were not able to handle the increasing traffic. The first railway was built in 1885 from Taiping to Port Weld and this was followed by one from Kuala Lumpur to Klang in 1886and. IN 1892 The railway was built from Seremban to Port Dickson and then there was a line from Ipoh to Telok Anson. Telok Anson was joined to Tapah road. 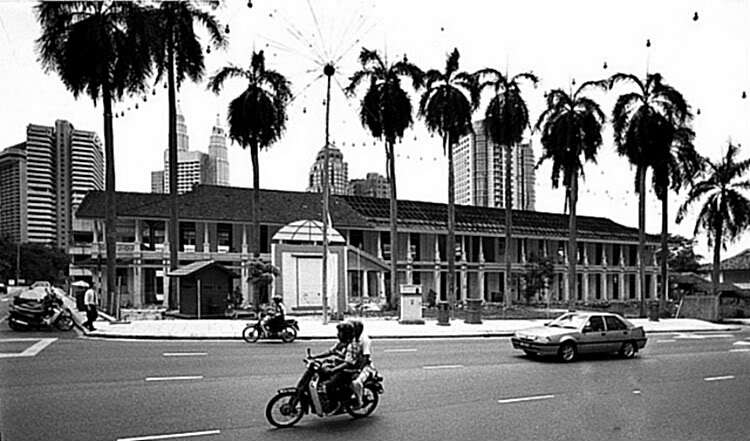 In 1886 a second line was built linking Kuala Lumpur and Bukit Kuda through the Connaught bridge. The British felt that building a railway with local labour was impossible. Appeal was made to Ceylon and the Ceylon government sent the pioneer corps. They included British engineers, Ceylonese subordinate staff and Indian labourers. The first core was 200 member strong and headed by John Trump. The difficult Bukit Berapit in Perak was tackled. They had to go through the jungle including building a tunnel under the hill. Everything was done by hand and later a second division of the pioneer core arrived. The traffic manager and his subordinates handled traffic and they prepared specifications and estimates assisted by locals consisting of tracers and draughtmans. Labour was provided by Indian labourers and the accounts department headed by a Britisher assisted by locals mainly Ceylon Tamils handled revenue expenditure and statistics. The Selangor railway had its compliment of station masters, drivers, guards, clerks, porters, watchmen and unskilled workers. 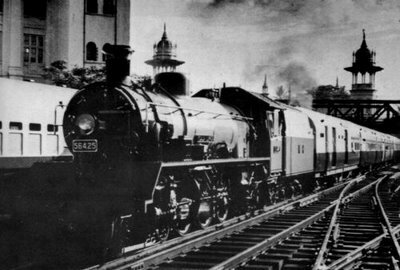 In 1930 the FMS railway took over the Selangor state railway. There were 189 British mainly technical and administrative staff, 1899 Indian and Ceylonese and others to fill the subordinate positions. Labourers were Indians and later the Sungai Ujong railway, the Johore railway and the Singapore railway was taken over by the FMSR. The Federated States railway set up the Sentul Workshop equipped with modern machinery. The need for technical staff was met by introducing a five year course in the evening. It was mainly Ceylon Tamils and Indians who benefited. Rolling stock was manufactured locally. Locomotives were imported from England and assembled locally. By 1920 Malaya had 959 miles of rail road and later train services to the east coast states from Gemas in Negri Sembilan was introduced. 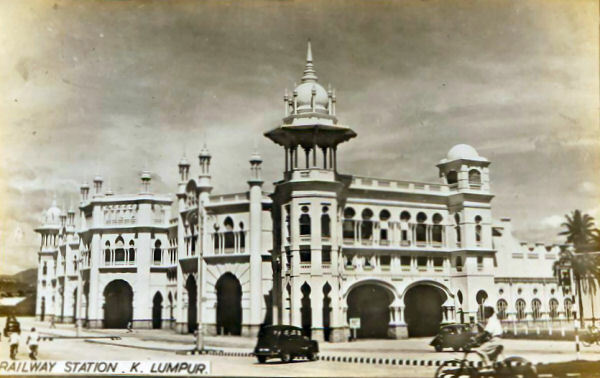 The train stations in Tanjong Pagar in Singapore, the Kuala Lumpur railway station and the railway administrative building and the Ipoh railway station became architectural masterpieces based on Moghul architecture. In 1923, the Johor Causeway was built. This entry was posted in Development of Malaya, Malayan History, Malaysia History and tagged Malaya, Malayan History, Malayan Railways, Malaysia, Yap Ah Loy. The Malay population remained in their villages where they pursued rice cultivation and other forms of agriculture. Every able-bodied man and woman helped in the planting of rice. Fruit trees and spices were for own consumption. Surplus rice was sold to others. Malay agricultural production remained the same as before the British. The plan of Swettenham to introduce Chinese rice farmers failed to materialize. The administrators wanted to increase rice production and improve the economy of the Malays. At the insistence of the British Resident, E. W. Birch, the Government got an irrigation expert from India for the Krian irrigation scheme. It was proposed to irrigate 50,000 acres. The scheme was implemented in 1906 at the cost of 1,600,000. The reservoir was 10 square miles. It could discharge six-and-three-quarter million cubit feet of water per minute. The main irrigation canal was 21 miles long. The town water supply also improved. Krian thus become the rice bowl of the country. The Krian Scheme served as example for the Sungei Manik and Tanjong Karang Schemes. After independence, the same principles were used for the Kemugu Scheme and the Muda Scheme. After 1890, coconut growing by farmers became popular. The coconut tree needs very little care. As assisted by a German from Singapore, R. Angler. Mr. Angler bought some land in Port Dickson and planted it with coconuts and introduced oil manufacture. He established his factory in Kuala Selangor. In 1909, the FMS had 215,000 acres of coconut plantations valued at 85 million dollars. Copra export became an important source of revenue. Indian labourers in lower Perak also worked on coconut estates. The Chinese immigrants proved to be versatile and supplied much needed labour of all kinds. The Methodist Mission started a scheme in Sitiawan. Jungle land was cleared. Though some left for better jobs, particularly tin mining, the scheme was a success. Lifestock was reared, especially pigs. Rubber was also planted. As townships grew, the Chinese squatters cleared the land and started market gardening. They produced fresh vegetables, reared pigs and poultry, and produced eggs. The Government though aware that the squatters were using the land illegally, did not take any action as they were satisfying a much-needed service. Indians also moved into Cameron Highlands and began producing vegetables for export. Flowers were also available in Cameron Highlands, Frasers Hill, Maxwell Hill and Penang Hill. During the Japanese occupation, some Indians from the estates took to market gardening. St. Joseph Tamil Settlement, sponsored by the Christian Missionaries, was established in Bagan Serai, Perak in 1882. Settlers were given eight acres each, and land was planted with paddy, coconuts and other crops. Indians were also settled in Chua, Negri Sembilan. They were assisted by the Government Veterinary Department to obtain the TOL (or Temporary Occupation License), where they could get title for a payment of 10 dollars. Quit rent was fixed at two dollars per annum. In the lower Perak district, 100 Indian families were sponsored for various schemes. Indians also benefitted from the Tanjong Karang Project. Ceylon coffee planters came to Malaya and tried their hand at coffee planting. insect pests destroyed The coffee plants were by. They were convinced by Ridley, the director of the Botanical gardens in Singapore, of the commercial prospects of rubber. 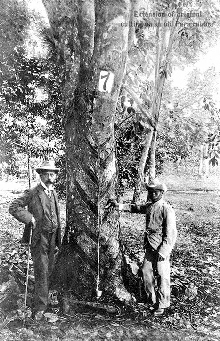 The rubber, hevea brasiliensis, is a native of South America. A few saplings were smuggled into the Kew Gardens in England and some were sent to the Botanical Gardens in Singapore. They were experimented on by Ridley. Seeds were also planted at the residency at Kuala Kangsar. Many coffee planters turned to rubber planting. In the 20th century, rubber became an important raw material for industries. Rubber was used for the manufacture of bicycle tyres, in addition to the earlier uses of the manufacture of rubber foot ware, various types of rubber hoses, hot water bottles and waterproof clothing. The price of rubber kept increasing. In 1915, the price rose fro two shillings and six pence per pound to three shillings per pound. Between 1892 and 1905, 50,000 acres were planted with rubber. In the 20th century, 100,000 acres were planted. By 1916, rubber had become a big revenue earner for Malaya. Plantations were not able to get sufficient workers from south India. Earlier, the indenture system was used, as in the sugar and gambiar plantations. The worker had to work for a certain period, normally five years, until his debts are cleared. Then the Kangani system was implemented. Under the Kangani system, the employer would name the number of workers required. The Kangani went to his village in south India to recruit his own people. The Kangani was reimbursed the charges for passage and other expenses. The Kangani got a commission. In 1907, as a result of representation by the United Planting Association of Malaya, an Indian Immigration Committee was set up. There were three official members, five from the planting industry and one from Singapore. The Immigration Committee was to import labourers for the Government, for the rubber industry and for private employers. The rubber planters were required to pay for the importation of labour. The Government benefitted. Government required labourers for the PWD, the Sanitary Boards and the Railways. The Government provided accommodation for its workers in lines, like the estates. The workers had to work for one year. It was the intention of the Malayan Government to encourage free labour. The Government required intending immigrants to present themselves at the depots in south India. Assisted immigration came to an end in 1935 with the Government of India banning all assisted immigration. In 1937, 237,300 Indian labourers were working in Malaya. A typical European estate was managed by a European manager (Periathorai) planting assistants were referred to a Sinnathorai. Dressers, clerks and conductors assisted them. The early ones were Ceylon Tamils. By 1920s, they were being replaced by the Malayalees. In every estate, there was a toddy shop and a temple controlled by the manager. The labour lines provided were filthy. There was over-crowding. One room was given for each family. Water supply was erratic. Latrines were communal. Workers were treated worse than animals. After 1935, with the intervention of the Labour Department, cottage type houses with four rooms were built. The labour code of 1927 provided for estate labourers entitled to one acre of land for part-time gardening. This was not implemented. The estates would not part with any land. The estate management was more interested n the high dividends for the British shareholders. After the war, labour conditions were further improved. Medical attention with doctors and dispensaries were implemented. Maternity benefits were added. Sanitary conditions were improved. Creches were also provided. It was intended to make estate labourers part-time agriculturalists. The plant which is a native of Africa, elaies guineensis was first introduced in 1850. In 1917, it began to be planted on a commercial basis. Its uses are for the manufacture of soap, candles, margarine, vegetable oils, grease and as an alternative fuel. Rubber prices fell after the First World War. In 1924, the Guthrie Group began planting oil palm. It flourished in the country. In Malaya, it could be planted throughout the year. In 1930, 3350 tonnes were produced. At the outbreak of the Second World War, 36,000 hectares were planted. In 1939, 58,300 tonnes was produced. After the war, natural rubber faced competition from synthetic rubber and prices fell. It started the process of converting rubber estates to palm oil estates. Today, Malaysia, the successor of Malaya, is the world’s leading producer of palm oil. Estate Tamil labourers and their families drifted to urban areas and lived as squatters. Other races, particularly the Indonesians, became oil palm plantation workers. Today in Malaysia, 57 per cent of oil palm workers are of Indian descent and the country leads in pal oil production. This entry was posted in Agriculture in Malaya, Development of Malaya, Ethnic Issues, Malayan History, Malaysia History, Rubber in Malaya, Tamils and tagged Agriculture in Malaya, India, Krian Scheme, Malaya, Malayan History. The claim of North Indian ancestry of the Singhalese people rests on the legend of Vijaya. The legend deals with the arrival of Vijaya and his 700 followers in Ceylon in the 5th century BC. According to the Mahavamsa, Vijaya is the son of a lion that is believed to have sexual relations with a woman, his mother. It is purely a myth. Historians have stated that the Mahavamsa lacks historicity and therefore could not be an authority. How is it possible for a woman to traverse from the west of India to the east and arrive at Sinhapura, which is located in Anga. According to General Cunningham, the father is Indian archaeology who in his book, “The Historical Geography of India”, had stated that Sinhapura was in Kalinga. Kalinga had not yet been Aryanised and peopled by Mlecca. Kalinga had ney been Aryanised. If Vijaya had come from Kalinga, then his followers must also have come from Kalinga. Kalingans who colonized Jaffna, established Sinhapura. Sinhapura was known as Singai Nagar, which served as the capital of the Aryachakarvathy rulers until the capture of Jaffna by Sapumalkumariah. The Mahavamsa had also changed the year of arrival of Vijaya, to coincide with the death of Buddha. Again, in order to give the Sinhalese a North Indian ancestry, it was claimed that he had married a lady from Buddha’s Sakya clan. The name of Panduvasa was changed to Panduvasudewa, which happened to be the name of a North Indian monarch during the Mahabaratha wars. According to K. Parker, a historian of great repute, the exile of Vijaya and his followers from Vijaya’s father’s realm, appear to be fictitious. Dr. D. C. Mendes says that the story of Vijaya seems to have been evolved to explain the origin of the Sinhala people. The Mahavamsa claim that Elalan was a Chola Prince is wrong. The Chola Kingdom only came into existence during the first century AD. Despite all the weight of evidence against the Aryan ancestry, there is a persistent belief that Vijaya and his followers came from Anga and the Sinhalese descended from Vijaya and his followers. There is no evidence of anything resembling Sinhala in North India. The Sinhalese people have been shown to have come about through the fusion of the Nagas, Tamils, Kalingan and the Yaksas. The Sinhalese language, though showing some affinity to North Indian Prakrit, was profoundly influenced by the Dravidian languages. Gate Mudhaliar, W. P. Gunawardene says that the determining factor of a language is its structure and not vocabulary. Sinhalese is essentially a Dravidian language. It got its vocabulary from Pali and Sanskrit, mainly through Tamil and the study of Sanskrit literature. Father Closett, the linguist, also came to the same conclusion. The Sinhalese grammar of the 13th century AD, drew much from the Tamil grammar virasoliam. It was studied in the Buddhist colleges throughout Ceylon. The Lokopakarya contains translations from the Thirukurral. Mahapadarangojatakakarya, the Singhalese version of the Mahabaratha war, was translated from Tamil. According to S. Paranavitana, the vast majority of people are descended from the Yaksas, Nagas and Tamils. Those who are Buddhists became Singhalese. The Tamils who remain Hindus absorb the Nagas and Yaksas as well. Dr. S. Bandaranayika says this has continued even in recent times. In 1952, there was an advertisement in the Ceylon Daily Mail reading, “I Veerasingham Francis Ratnasingham will henceforth be known as Vernon Francis Ratnasinghe”. This shows how easy it is to become Singhalese. And the process continues even in recent times. Dr. P. Ragupathy exerts after extensive research that the Singhala and Tamil identities stem from a common cultural stratum. In the early days, it made for tolerance and religious accommodation. The Buddhists were not persecuted under Elala. The Mahavamsa claim that the Elalan Dutagamani conflict is religious is not true. According to K. M. de Silva, Singhala Kings who practiced Buddhism supported Hindu Temples and also allowed Hindu deities to be worshipped. The Hindus and Buddhists, jointly worshipping at Kataragama and the Buddhists visiting the Nagaposhani Temple at Nainativu should be noted. Dutagamani is on record as having built the temple for Skanda at Kataragama. E. R. Saratchandra says that most Singhalese plays were translated from the Tamil originals. Godakumbara says that the words Kolama and Nadagama have Tamil roots. This entry was posted in Ceylon History, Jaffna, Tamils, The Tamils in India, Ceylon and Malaya and tagged Ceylon, Tamil. India’s involvement in Ceylon goes back to many years. India gave its culture, religions and languages to the Ceylonese. Indian rulers particularly those from South India, carried out conquests and got involved in the dynastic struggles of Ceylon rulers. The most important conquest of the early days was the conquest of Ceylon by Kalingan Megah. It is believed that the Pallavas started from Ceylon, got themselves established in an area between the Godavari and Krishna rivers. They learned the Aryan methods of administration and accepted Aryan practices. They then expanded into India. The Nayaks from India had later become kings in Kandy. Indian involvement in Ceylon particularly politics came about with the formation of the Ceylon National Congress modeled on the Indian National Congress in the early part of the 20th century by Sir Ponnampalam Arunachalam. The Jaffna Youth Congress was established. Indian leaders like Nehru addressed the Jaffna Youth Congress in Jaffna. The Youth Congress became very much influenced by the Indian National Congress’ call for full swaraj (full independence) from the British. It was this demand for full swaraj from the Indian National Congress that prevented Gandhi, the sole representative of the Congress at the Roundtable Conference in 1930, from accepting the offer of dominion status that was offered by the British Prime Minister Ramsay Macdonald. The Youth Congress became of the refusal of the British to give full swaraj, decided to boycott the Donoughmore Constitution in Ceylon. The Jaffna population was taken in by the Youth Congress, which was led by the people in Jaffna and not Colombo. It boycotted the Donoughmore Constitution. No one was elected from the Northern Province to the State Council set up by the new Constitution. It was to the detriment of the Ceylon Tamils. 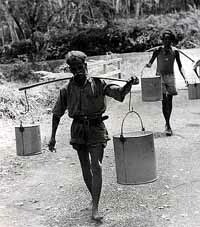 After independence, the Ceylon Government disenfranchised the Indian workers who were brought by the British to work on the estates, both rubber and tea. They had helped in the economic development but this was not considered important. The Indian government protested. After negotiations, it was decided to repatriate workers that were willing to go back. The problem was partly solved. There were grievances felt by Ceylon Tamils. They felt they were discriminated against in jobs, university education and in the use of their language. Earlier, the State Council had decided that Singhalese and Tamil would replace English as the official language after independence. But with pressure from Singhalese chauvinists, the Singhala Only Act was passed. There was a demand for a separate state by the Tamils. Youths, under the leadership of Prabakaran, were preparing for an armed struggle. The Tigers who were first trained y the Palestinian George Habash, later began training in South India. Mrs. Indira Gandhi feared the pro-Western government of Jeyawardene. She had hoped that the Tigers would destabilize the government of Jeyawardene. She denied any knowledge of the Tigers’ training in South India. After the pogrom in 1983 where thousands of Tamils were killed, Mrs Gandhi sent one Parthasarathy. Later there was the Chitamparam Natwar Singh visit. During Rajiv Gandhi’s regime, the Indo-Ceylon accord was signed in 1987. One provision of the Accord was to confer Ceylon citizenship on stateless Indians but this was never implemented. With the signing of the accord came 100,000 Indian troops as a Peace Keeping Force. It was intended for the rebels to surrender their arms. Provisions in the Accord stated that the rebels should hand in their arms to the Indians. Mr. Jeyawardene believed that eventually the Tigers would fight the Indian troops and he was proved right. This was the best chance of settling the ethnic question and the Tigers should have sided with the Indians. The Tigers fought the Indians and this was a big mistake. In the election for the Northeastern (the merged Northern and Eastern) Province provided for, the Tamil United Liberation Front (or TULF) did not take part. As the TULF was already discredited in the eyes of the people. Only the EPRLF-ENDLF, a pro-Indian coalition took part. Mr. Varadaraja Perumal was elected Chief Minister. The Tigers did not support the Northeast Government and again fell into the trap of Mr. Jayawardene. The administration of the Northeast was taken over by the President. 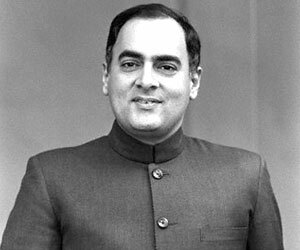 During an election rally, Mr. Rajiv Gandhi was assassinated by what was believed to be a Tiger cadre. The Tigers were banned in India. India was keen to destroy the Tigers. In the war between the Sri Lankan Army and the Tigers, India sided with the Sri Lankan forces. The Tigers were finally defeated in 2009, with Chinese arms and Indian radar assistance. This entry was posted in Ceylon History, Ethnic Issues, Jaffna, Tamils, The Tamils in India, Ceylon and Malaya and tagged Ceylon, Jaffna.